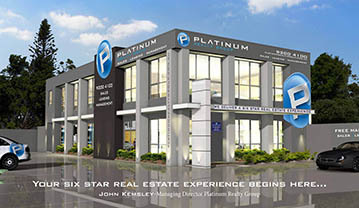 Managing Director John Kemsley says that the Platinum brand is a true reflection of our company’s core values: to be multi-faceted, modern and innovative; a total solution company that remains focused on delivering a 6 star real estate experience to our clients. Platinum and the company behind it has become just that, a total solution brand ensuring all aspects of property services are catered for specialising in Property Sales, Property Management, Property Maintenance as well as Finance, Investment and Settlement advice. What this offers our clients, in this busy modern era, is the confidence that they are looked after from A-Z. We cover it all. Since the year 2000 it has been our focus to deliver the very best real estate services available. To achieve this goal we have embraced ongoing training, we work with the best people and utilising bold and exciting marketing initiatives. We also recognise the importance of understanding the online market, which is a powerful tool in today’s marketing. Our own website at www.platinumrealtygroup.com.au is a sophisticated, yet user-friendly website with the most up to date design features. Our Company has been here for a long period of time, and has earned a reputation for delivering outstanding results time and time again, and as a result almost 50% of our business now coming from referral and repeat clients. To achieve our end goal, of delivering a six star real estate experience, we believe in being transparent, open and honest and forming lasting relationships with those we work with. You will work with the best people at Platinum, all whom are Professional Award Winning Agents that will keep you informed and work in your best interests at all times. We are competitive. We have been described as market leaders and we are a company that you can trust and rely on. Contact Platinum today, because when you engage Platinum you engage our total commitment.